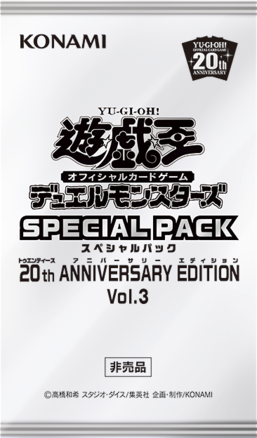 Special Pack 20th Anniversary Edition Vol.3 is a supplementary Booster Pack in the Yu-Gi-Oh! Official Card Game given to buyers, who spent ¥1000 or more on Yu-Gi-Oh! products between September 8 and October 12, 2018. This page was last edited on 15 November 2018, at 07:28.